Valentine Design Studio is the web-based home of artist and designer Gerald E. Valentine. Gerald created VDS not only as an interactive online portfolio, but also to be a place where those who need professional design services can get exactly what they need at reasonable prices. VDS prides itself on its award-winning design aesthetic and it's ability to provide fast and affordable results to our clients. VDS provides a variety of design services, from website design, to logo and collateral design and more. 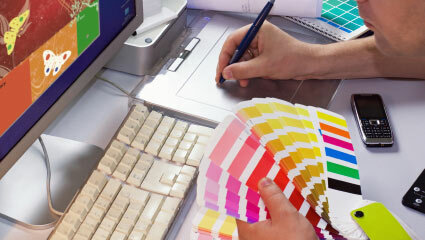 Whether you just need the digital files to produce yourself, or you need a full-service one-stop shop to provide both design and production, VDS has the right plan for you. There's no project too large or too small for our dedicated designers to handle. For a complete list of our services, visit our services page. Gerald is a graduate of The School of the Art Institute of Chicago and holds a Bachelor's degree in Fine Art. He is also well versed in several art mediums both physical and digital. In his spare time Gerald enjoys board gaming and painting miniature figurines.